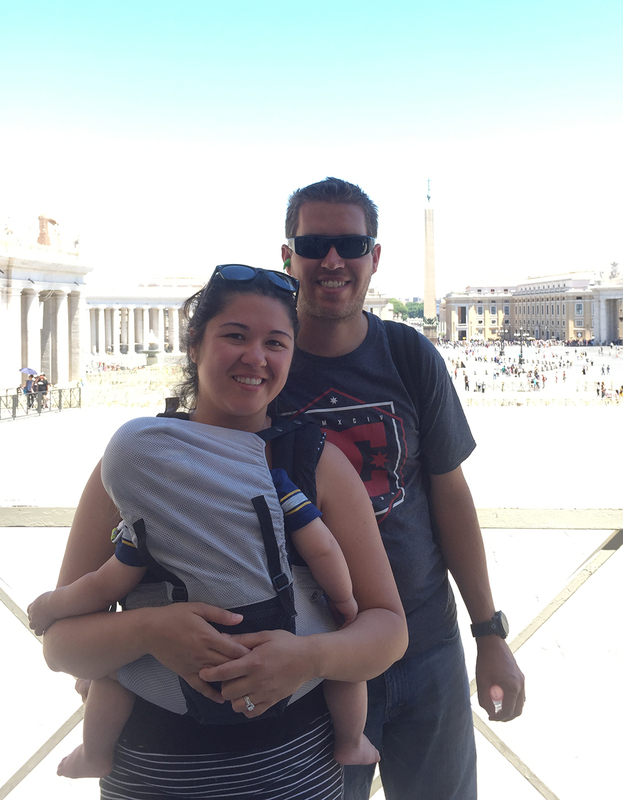 Before I start I have to admit that I had major anxiety about traveling abroad with my 1 year old son, Atlas. All you hear are the horror stories about planes with babies and we were supposed to take SIX flights over the course of two weeks? Not to mention three back to back flights in a 24 hour period. I had a feeling we were absolutely insane. Tack on the fact that I am terrified of planes and I was having some major anxiety about the trip we took last month, but I’m here to tell you that it wasn’t that bad and it was so worth the effort. Our European getaway was about two weeks with the first few days visiting Paris, a day in Barcelona and then a 7 day cruise through the western Mediterranean hitting several beautiful cities in France and Italy. It was jam packed and we loved every single minute of it. Atlas did too! 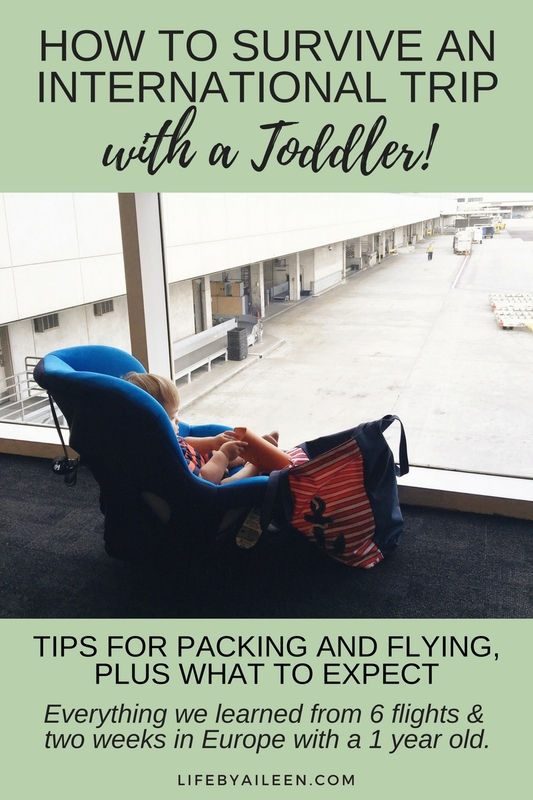 The goal of this post is to provide every bit of information you might need to travel to Europe with your baby or toddler. Every little tip we learned along the way all on our own. 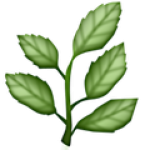 This post contains affiliate links to products I mention within the post. It is not sponsored and you are not obligated to click or purchase anything. I think this is the first thing people worry about. What do you bring? It’s so hard to know what is hard to find, or different from what you’re used to, when you’re traveling somewhere new. I never realized how much stuff babies and toddlers need until I had one. Since we were going to be out in different places a lot we had our diaper bag stuffed full and just made sure to have everything he could possible need. We kept snacks, his carrier, extra clothes, etc. in it. This is the bag we’ve been using forever. 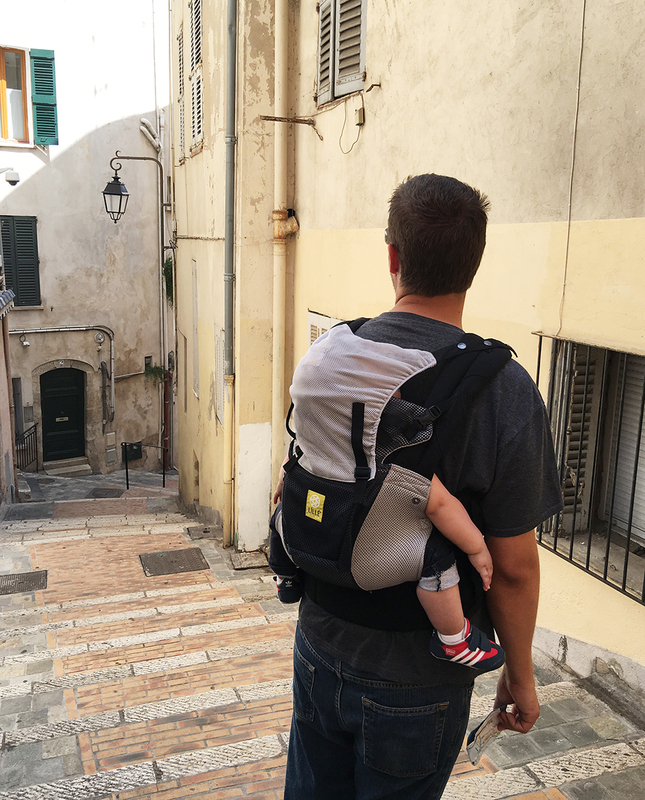 We bought our Lillebaby Airflow right before the trip and could not have been happier that we did. Not to mention it’s now our favorite carrier because it’s a more breathable fabric and Atlas can forward face in front and check out what’s going on. Anytime we needed to walk for more than a couple of minutes Atlas went into the carrier. Anytime we thought he needed a nap, he went into the carrier. This was the best decision we made by far! The only thing that was annoying is that when it wasn’t in use it was really bulky and took up almost his whole diaper bag, but even then: Worth it! We decided not to bring a stroller after hearing that Europe can be hard with a stroller, but of course some people will so I wanted to include it. After being there I think we actually would have liked the convenience and some of the places we visited it would have been fine. But you have to remember the inconveniences too like having to lug it around when not in use. 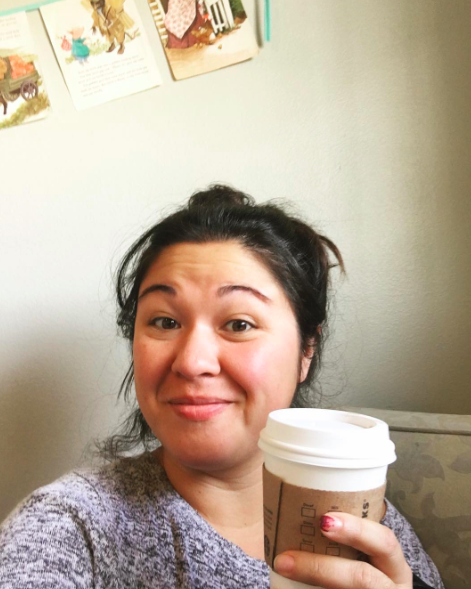 When you’re traveling having less to carry (especially when you have a toddler to chase) is key. If you do get one I recommend getting a super compact one. I seriously considered getting the Pockit stroller because of the fact that it folds into a neat little cube. After much debate we decided to buy my son a seat on all of our flights. He is not content sitting on our laps for even a few minutes, so I could not imagine trying to force him to sit still on our laps for several flights. Plus, I felt much more comfortable about his safety knowing he was strapped in during take off/landing and turbulence. We bought the super light weight (and cheap!) Cosco Serena Next. It was so easy to install and seriously super light. If you’re coming from the US and you’re bringing your carseat make sure you have a locking clip and know how to use it. Some carseats come with them, some don’t, so double check. Many European cars do have a latch system, but some don’t and their seat belts don’t lock so you’ll need a locking clip to safely install the carseat. Here’s a quick video on YouTube that shows you how to use a locking clip. We fought with a lot of people over our carseat. Air Canada for our first flight from the US to our connecting flight in Canada was fine. But then in Canada we argued until I was literally in tears and held up the plane because they said my car seat didn’t meet their regulations. Luckily I was eventually able to pull up their car seat guidelines from the Air Canada website and show them that I was right and they eventually let us on. Save yourself the trouble and make sure you read up ahead of time and either have the pages pulled up on your phone or printed out and easy to access. If you’re bringing your car seat you need a traveling toddler strap! It straps your carseat to your rolling luggage so not only are you freeing your hands up from carrying around car seat on top of everything else, your toddler can actually ride in it. My son is a good 25 lbs and we had no problems rolling him around the airport. Whoever invented this is pure genius! He even napped in it for about an hour at one of the airports. So worth it! For the plane ride and other times when your family might be stuck somewhere with a bored toddler having a few small toys or books is the best. I recommend buying a couple new toys so they’re more exciting. I read somewhere to have an activity planned for every 15 minutes on the plane. Luckily my son slept most of the time, but I had a ziplock bag of toys for him to play with (one at a time) when he was up. I even wrapped some up in torn out magazine pages and tissue paper to make them fun to unwrap. I got all of mine at Dollar Tree and the dollar spot in Target so you definitely don’t have to spend a lot. I spent under $10 total on brand new toys for him. My son is a big eater. Anytime he’s upset you can just give him a snack and he’ll usually calm down. So basically my plan was to stuff him full of food the entire plane ride. I’m only half kidding. I had a huge ziplock bag full of snacks. We brought: goldfish, food pouches, toddler wafers, peanut butter sandwiches, etc. Here’s a quick YouTube video of what I grabbed at Big Lots right before the trip. 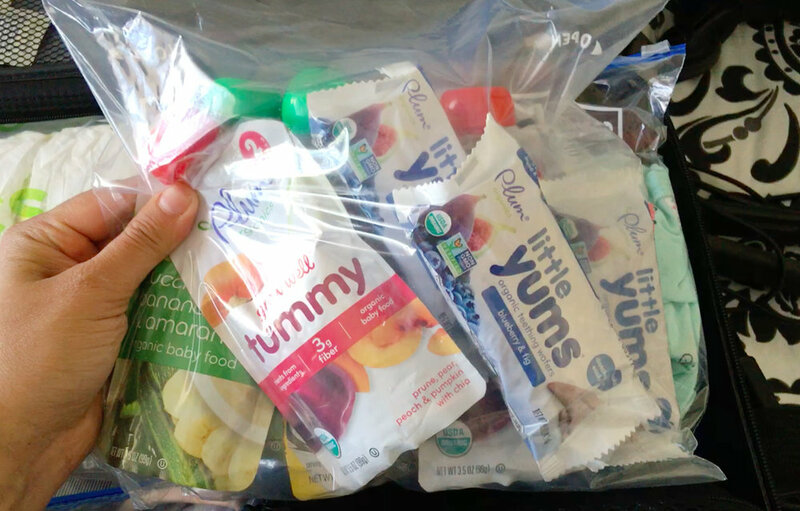 Anything bought in bigger bags was portioned out into little baggies so I could easily grab food for him and so we didn’t have to bring huge bags of stuff with us. My son is past the spitting up stage, but he somehow he managed to leak on my shirt before our very first flight and because I didn’t have my luggage I wasn’t able to change until the next day when we got to Paris. I recommend bringing an couple extra outfits for your kiddo, but also a change of clothes for mom and dad (and anyone else) too. Just in case. Make sure you bring everything you use at home for sleeping. If your son or daughter has a favorite stuffed animal they sleep with, bring them! And make sure it’s always accessible. For Atlas we brought his elephant stuffed animal that he sleeps with, several pacifiers, his favorite blanket and his sound machine. We made sure everything except his sound machine was in the diaper bag for plane rides too. We actually didn’t even really end up using these much because he slept so long, but look at these adorable headphones for toddlers! Much better than trying to let them use our giant headphones. They’re super small and easy to pack. If you’re going to be eating out, I recommend getting a placemat that you can bring along that can be wiped down. We have one of these and we bring it everywhere! My son is only 1 and not so good with plates or utensils yet so we just place down this placemat and put his food on it. You can also get disposable placemats, but I prefer to be a little more eco friendly so I opted for a reusable one. Depending on how long you’ll be gone you’ll need to decide if you want to bring enough for the whole trip or if you’ll be buying at your destination. We had a lot of trouble finding diapers during our trip! Pharmacies are your best bet if you’re in a big city. We actually brought enough diapers to get us through more than half the trip, but had to stop twice for diapers. The first time we were able to find some at pharmacy at the train station. The second time we walked around Montreal during our 24 hour layover in Canada for a good 30 minutes trying to find diapers, but all of the pharmacies only carried newborn sizes. Finally we decided to ask our cab driver if he would take us somewhere for diapers on our way to the airport and he happily took us to Walmart. Lesson learned: don’t wait until the last couple diapers to try and find more because it might not be as easy as you think. Also, know your baby’s weight in kilograms because that’s what will probably be listed on the package. I guess this is something you need to really think of for most trips when you’ll be doing a lot of exploring. We brought some Badger sunscreen for my son and just kept it in his diaper bag. Atlas only really uses his pacifier when he’s sleeping, but since he was sleeping on the go a lot (planes, cars, while being worn) we made sure we had a handful of pacifiers in case one was dropped or lost. A good pacifier clip helps too! These are the clips we have and they work great. Like I said before, this is what gave me the most anxiety, but ended up not being so bad. That being said here are some tips I picked up along the way. 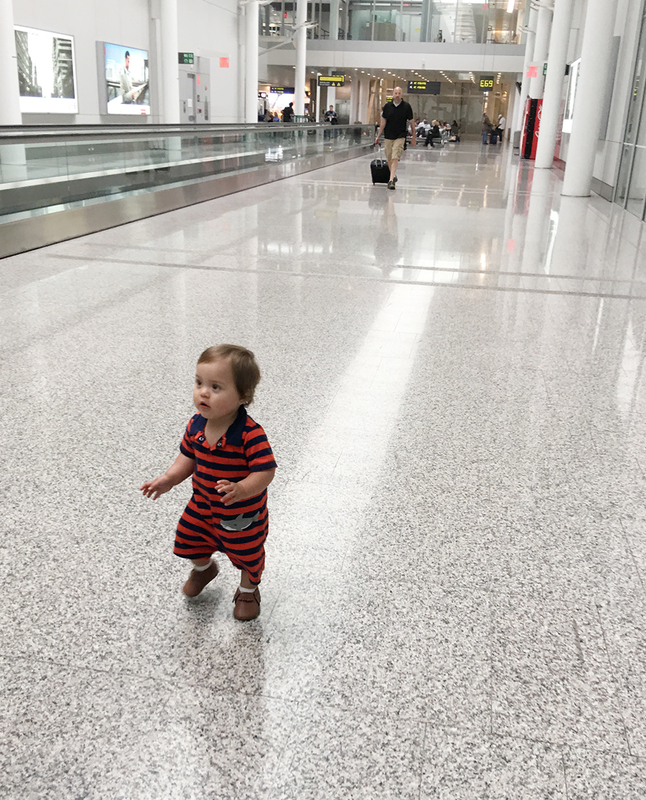 While we waited for our flights we did our best to find a less crowded area of the airport so Atlas could walk around and get all of his energy out. He had just started walking so he wasn’t all that stable on his feet so having some open space for him to just roam around (and constantly fall) was helpful before we had him sitting on a plane for up to 8 hours. If you have a carseat try to be one of the first people to board. On every flight we went on they allowed people with babies to get on the plane first to get settled. Because we had a carseat and wanted to make sure we got it installed and weren’t whacking people on the head with it as we went down the aisles, we went on first. If you aren’t bringing a carseat and your kiddo needs to get out some energy then it might be best to board last so they aren’t stuck sitting for too long since you can sometimes wait quite a while for other people to board. 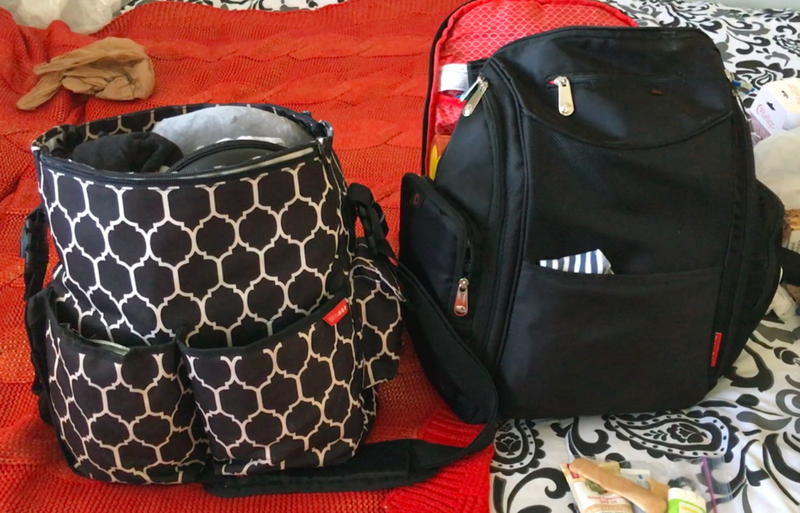 Many airlines won’t count a diaper bag towards your carry on/personal item allowance. Make sure to double check their website before you go. We packed everything he needed (mostly) in this diaper bag backpack that we’ve been using forever and it’s great! Like I mentioned in the above, bring lots of snacks. 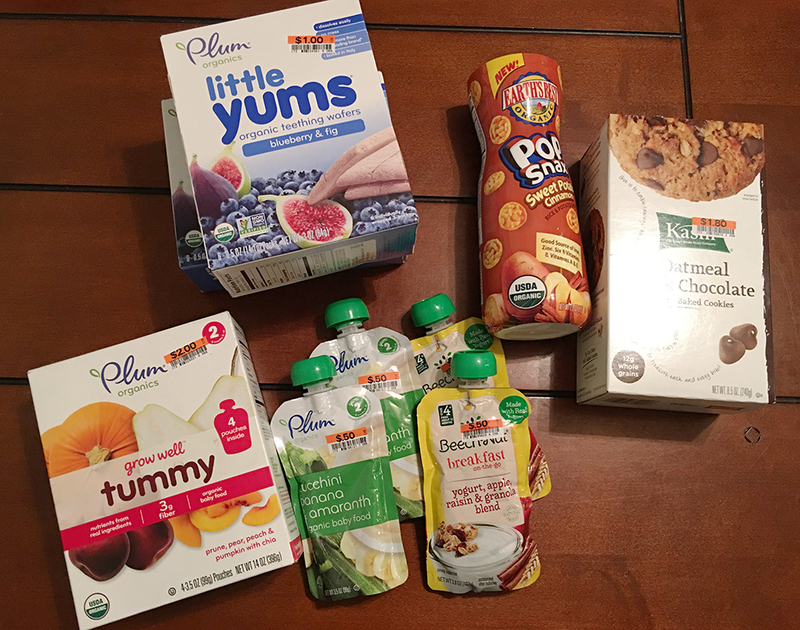 Make sure you have a variety in case your little guy or gal is feeling picky. Goldfish crackers in one of these cups take some time to eat so it’s also kind of an activity as opposed to something they can shove in their mouth all at once and be done with in 30 seconds. A lot of people are afraid to bring food on board, but you really can bring most items. Here’s the website for FAA regulations. I brought an entire 1 gallon ziplock bag of snacks with no issue. We were allowed to bring on my sons sippy cup with water with no problem. We just had to open it so they could check the contents in security. We even were able to sneak on several water bottles for the baby. In general security seems to be pretty understanding when you have a child in tow and they’re a little more lenient. I know I already mentioned it above in the “What to bring” section, but I thought I’d mention it here just in case you skipped to this section. Brand new small toys are key. Wrap them in tissue paper or something similar and let them open them up and play with them one at a time. I filled a 1 gallon ziplock bag with various small toys. To be honest, he didn’t even play with half of them because he was asleep a lot of the time, but it was nice to have them. I would probably reduce the amount to maybe 5 or so next time, but I was happy to have the peace of mind knowing I had plenty to entertain him with. 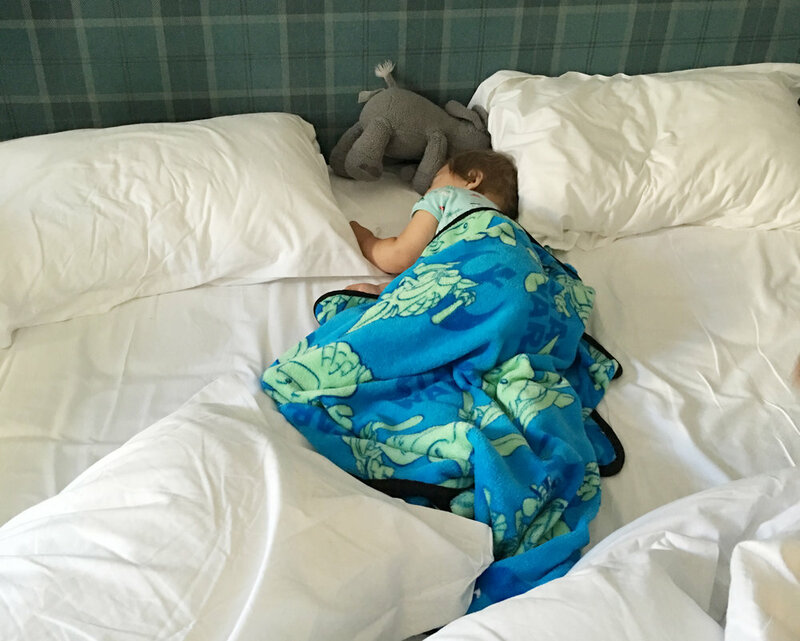 If you’re lucky your toddler will sleep on the plane! On several of the flights Atlas was passed out before we even took off. All of the noise from the engines, etc. is really great, loud white noise and made him sleep really well. 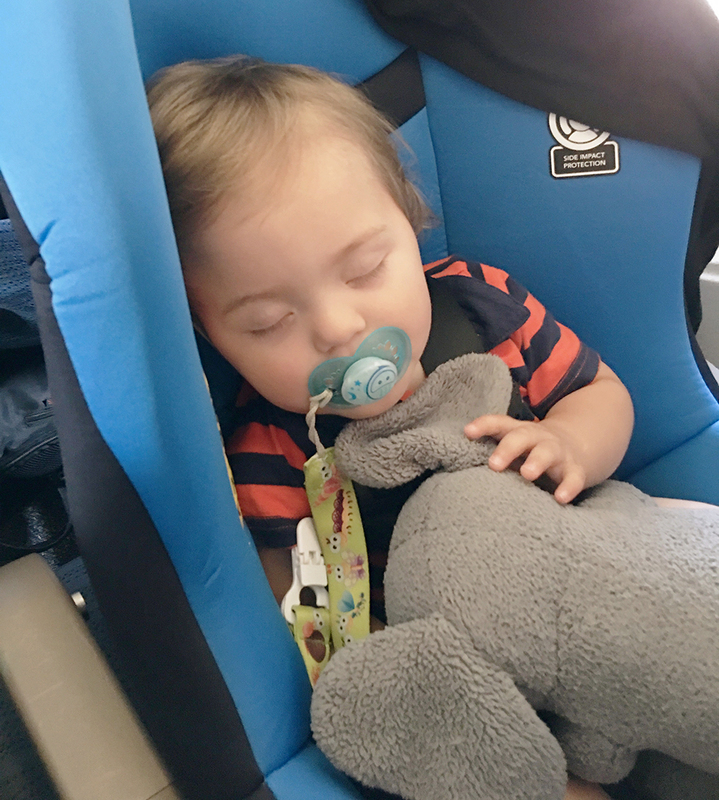 We encouraged it by buckling him into his carseat and giving him his elephant and pacifier when it was about time for the plane to get ready for take off. I would say he spent about 75% of the time we were in the air asleep. Some flights he slept through the whole thing, some of the longer flights he would wake up every few hours to have a snack and pass back out. It was actually kind of magical and he only got cranky about being stuck in his seat a couple times. A few of the planes we were on had changing tables in the bathrooms. My husband was the one who did the changing, but he said they were fine and he didn’t have any complaints. I did change one diaper on the plane seat which works if you have a couple of seats next to each other. If you have a particularly stinky diaper ask the flight attendants if they have a bag you can put it in to lock in the smell. If you have a toddler you already know what it’s like to not have enough hands. Add luggage to that and it seems impossible. We did our best to pack light with just one big suitcase for Atlas and I and then my husband, Blaine, had his own smaller suitcase. We did have a few carry on’s, but overall we packed pretty light on purpose knowing that we might have to carry Atlas around too. I also mentioned buying the Traveling Toddler Strap previously if you’re bringing a carseat. It saves you from carrying the carseat and your child. People in Europe love babies! People are probably going to go out of their way to interact with and, possibly, touch your baby. Honestly it didn’t bother me that much, it just caught me off guard the first few times so just be aware and if it’s something that bothers you, keep your child close. Though that might not do much because several people came up to Atlas while he was being held. Just be aware and decide how you’re going to react if you feel like you need to. It’s crowded, be very cautious. Almost everywhere we went had busy sidewalks. Atlas isn’t at the age where he walks with us everywhere yet, but he’s getting there and it would have made me very nervous to turn him loose on the streets of many of the cities we visited. If you’re going to bring a purse, try for a small cross body bag with a zipper. People kept warning us about pick pockets so we made sure to have secure purses that we could have well attached to us at all times. Crossing the street is a little scary. Look both ways. Twice. Three times. One tour guide told us that this is how you cross the street in Naples: “close your eyes and run for it”. Obviously she was joking, but seriously, just be cautious because people tend to drive fast and don’t stop for pedestrians. Start early and have dinner in your hotel room. We did push it a few times, but for the most part we woke up early and did all of our adventuring during the day then retired back to the hotel room around 6 or 7. A few of us would go out and find some food to bring back to the hotel and eat while we relaxed. Atlas was seriously such a champ, but being out sight seeing for 12 hours is tiring enough without keeping him up way past his bedtime (which we did do occasionally). Try to stick to your bedtime routine. Keep your routine as close as possible to how it is at home. For us Atlas would get changed, have a bottle while we read to him (we brought the two books we read every night) and then he would go to bed. Call ahead and ask if your hotel has cribs. The hotel we stayed in while we were in Paris had a crib that they set up for us which was nice! Same in Barcelona. We also saw some places that you can rent baby gear from and they’ll bring it to you when you arrive so you can look into that as well. Atlas co-slept with us a lot of the time we were in Europe, but when we did have a crib available it was nice because we could put him to sleep before we were ready before worrying about him rolling off the bed. Don’t pack your days too full. When we were in Paris we had only two full days and I had all these grand plans of what we would get done those two days. We didn’t even get to half of them. Being in a totally new country where you might not speak the language is super stressful, add a toddler and it’s best to just pick one or two things to do each day rather than to try and pack a million things in ensuring that no one enjoys themselves. Give your kids a break. Throughout the day we would stop in places where Atlas could explore on his own without us being in a hurry. 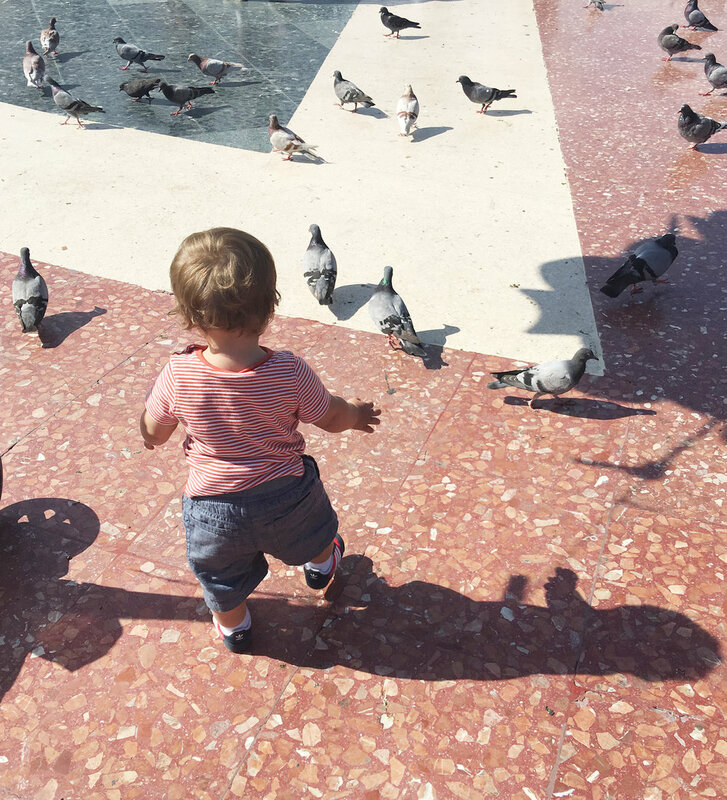 Whether it was just letting him explore the pigeons by the fountain when we were in Barcelona or even just playing in the little kid room when we were on our cruise, we made sure he had some time to do something he wanted to do every single day. Take advantage of diaper changing opportunities! Europe can be hard when it comes to changing diapers. If you find a good place to do it, but it’s not quite time yet, consider where you’re going next and if you know there’s going to be a good place there. 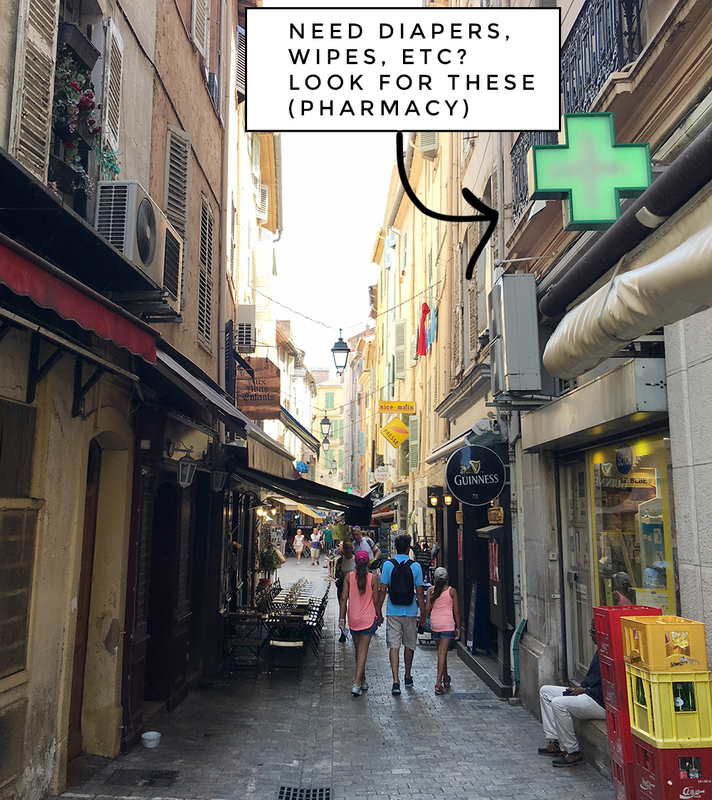 When Atlas started leaking while we were visiting Notre Dame in Paris, my husband searched high and low for a bathroom and when he found one it was a gross Subway bathroom where he changed Atlas on the floor. He joked that we needed to burn the changing mat when we got home. Try for naps on the go. 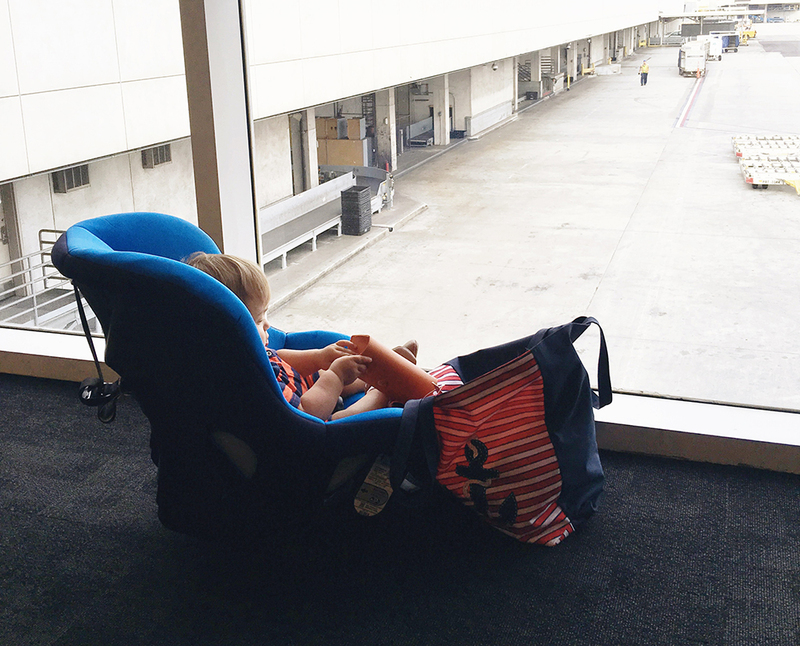 Whether you brought a stroller or a carrier, try to get your kiddo to nap on the go. Even if you don’t think they will, give it a try. Atlas usually will not nap outside his crib. But honestly, he was just exhausted enough from all the traveling and that mixed with the bouncing of us walking while he was on our backs in the Lillebaby Airflow made him pass out fast. We had actually planned to go back to the hotel mid-day for a nap for the couple days in Paris, but ended up not having to which helped us do more and see more! 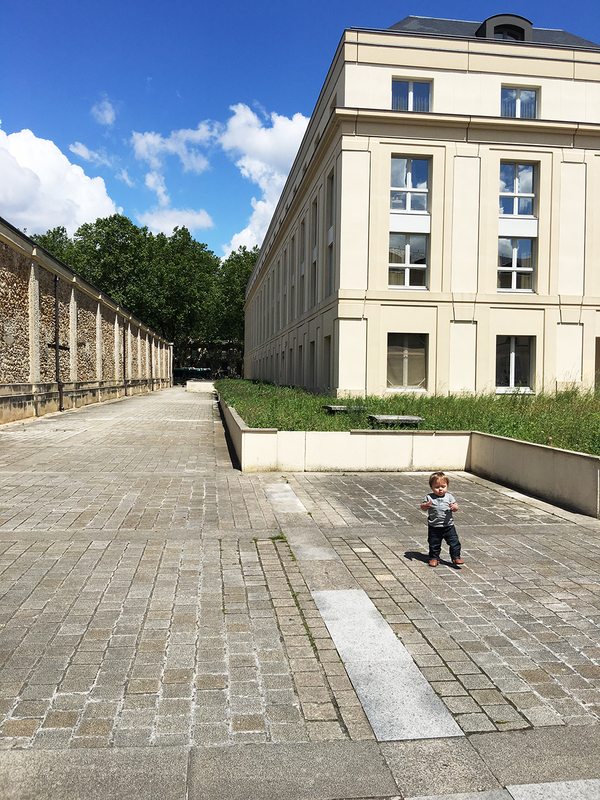 That kid napped through much of our tours of the Palace of Versailles, the Lourve, the Vatican and Pompeii. I don’t wear him much in general because always he wants to explore on his own, but I’m so glad we decided to give it a try on this trip. Plan for weather. We got rained on in Paris and we were stuck on a tour in Pompeii for several hours in the heat with little to no shade. An umbrella would be a good idea for both situations. Just try to think ahead to what the conditions might be where you’re headed to each day so you can be prepared. Getting stuck in less than ideal weather is 10x worse with a kid in tow! Whew! 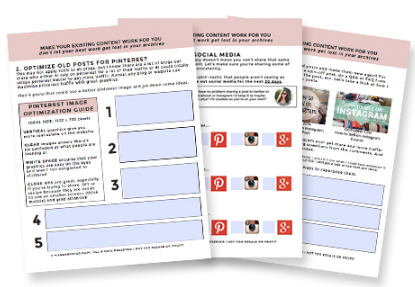 I hope that this post has proven helpful for any of your own upcoming trips. If you have any questions at all I would love to answer them so feel free to leave them in the comments below.